Some blog owners are becoming confused by the AdSense activation process, and are applying directly to AdSense. 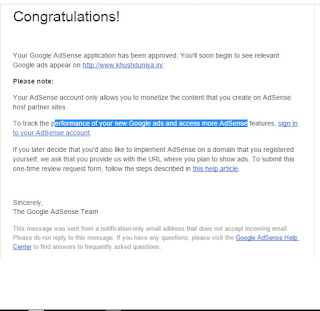 If you apply directly to AdSense, you will be applying for an AdSense For Content account. AdSense For Content requires a properly qualified top level domain website. If you have a fully qualified top level domain website - or a Blogger blog already published to a custom domain, again, fully qualified - you can add a Blogger blog published to BlogSpot, as an additional ad host. If, like many Blogger blog owners, your blog is your first step in Internet activity, you cannot accomplish anything by applying directly to AdSense. With a Blogger blog published to BlogSpot, you need a Blogger Hosted AdSense account. Blogger Hosted AdSense accounts are only available from the Earnings page. You get a Hosted account by using the Blogger dashboard Earnings page - when the Earnings page becomes active. When your blog is eligible to apply for a Blogger Hosted AdSense account, using the Earnings page, you may get misleading advice from AdSense. Your Google AdSense application has been approved. You'll soon begin to see relevant ads appear on (your blog)." 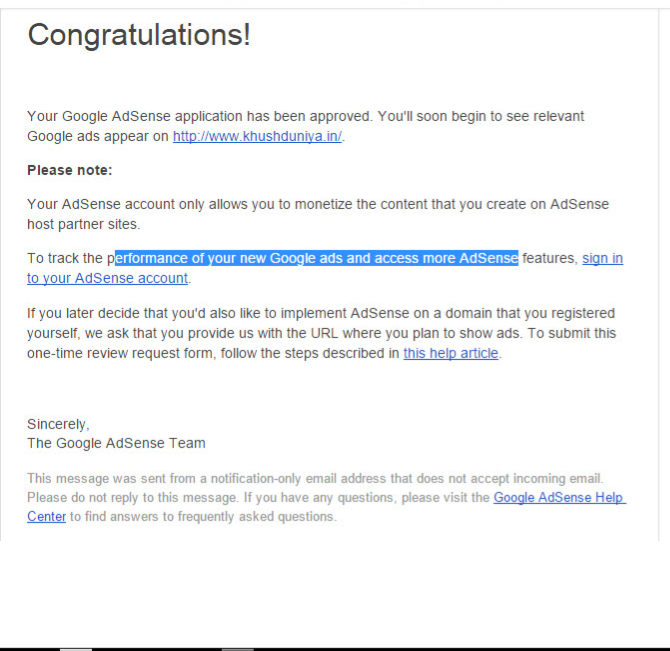 AdSense has a two step approval process - and this is the first step. There are actually four steps, before paying ads will appear. When you receive the congratulations, do not immediately begin spending the money. This notice is currently being sent to many blog owners - some with completely unsuitable blogs, who will never see ads. 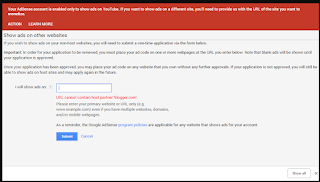 If you apply directly to AdSense, and are instructed to install ad code - don't. In some cases, you may apply directly to AdSense - and you may be instructed to install ad code, available from the AdSense website. This will bring you no close to seeing ads, on the blog. AdSense For Content ads will not appear, on a Blogger blog published to BlogSpot - again unless the account is already fully approved, based on a properly qualified top level domain website. Your AdSense account is enabled only to show ads on YouTube. If you have Blogger or YouTube hosted AdSense, don't bother to install AdSense ads - or use a custom domain hosted blog with AdSense. If you have a properly qualified top level domain website, you are probably not wasting time reading this. You are either working on your blog and / or website - or are somewhere else, spending the mega bucks. When your blog is eligible to host ads, Blogger will activate the Earnings dashboard page - and you can use the automated ad installation. You don't need to hand install AdSense ads, on a Blogger blog - and you gain nothing by doing so. If you just setup your Blogger blog, leave it published to BlogSpot. A new Blogger blog, published immediately to a custom domain, will not fast track eligibility for ads. AdSense For Content requirements are more selective than Hosted AdSense accounts. If you're not seeing ads using Blogger Hosted AdSense, you're not going to see ads after applying for AdSense for Content, using the AdSense website. Leave your Blogger blog published to BlogSpot - until it is full and properly approved, and ads appear, using Blogger Hosted AdSense. Then read about, understand, and plan for your blog to undergo the AdSense account upgrade process. Some #Blogger blog owners, eager to begin hosting AdSense ads, grow impatient from inability to use the Blogger dashboard Earnings page to setup their blog with ads. 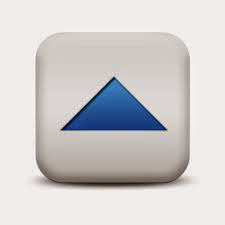 They apply directly to AdSense, hoping to speed up the ads activation process. Normally, they will receive advice from AdSense that they should apply through Blogger (and the Earnings page) - but some receive instructions about installing ads from the AdSense website. Having installed the ads, they wait in vain for the ad content to immediately appear. Thats mean that i cant apply Adsense ? Thanks for the question. You can apply for AdSense, when the blog has sufficient content - and the Earnings dashboard page becomes active. You just don't apply, using the AdSense website. The AdSense website provides AdSense for Content - end you need Blogger Hosted AdSense, for a BlogSpot published Blogger blog. Blogger Hosted AdSense checks blog content automatically, as each post is published. When blog content is sufficient, the Earnings dashboard page is unlocked. You can apply, using Earnings - when Earnings is unlocked.